The Park is located in northern sector of the Grosseto province in Tuscany, central Italy. 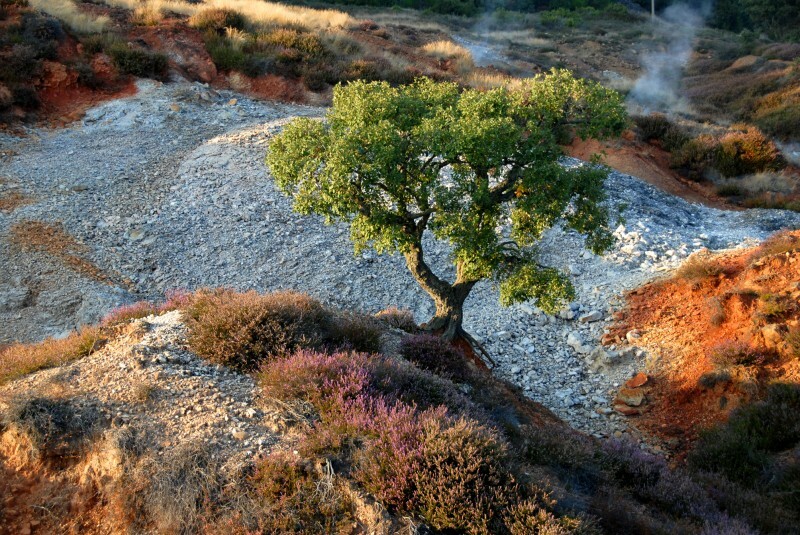 The park coincides with the territory of the Colline Metallifere (Metalliferous Hills), the most important mining district in Italy together with some zones of Sardinia. The area of the Park extends on a whole surface of 1087 km2 and includes the territories of seven municipalities: Follonica, Gavorrano, Massa Marittima, Monterotondo Marittimo, Montieri, Roccastrada and Scarlino. This area has a relatively low human presence as the resident population is of 53.549 people with a density of 49.3 people/km2 against a level of 198.8 people/km2 for the whole Italian territory (ISTAT 2007). 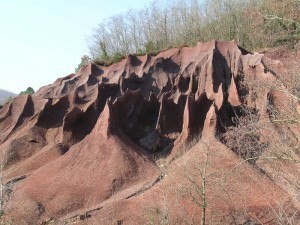 The present geological features of the Park area are the result of the long and complex geological evolution of southern Tuscany mainly focused on the formation of the Apennine chain. 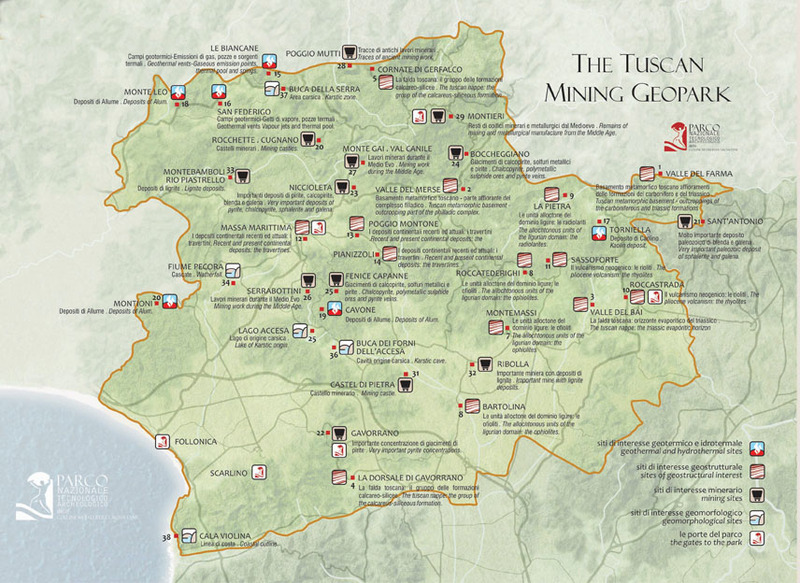 The Apennine orogenesis caused in southern Tuscany the translation and overlapping, from SW to NE, of tectonic units from different sedimentation and paleogeographical areas: Ligurian domain, Subligurian domain, Tuscan domain. The Ligurian domain was an oceanic basin formed by ultrafemic and femic magmatic rocks (ophiolites) covered by a sedimentary succession deposited in a deep marine environment. The Subligurian and Tuscany domains were epicontinental settings constituted by a metamorphic basement underlying a sedimentary coverage. 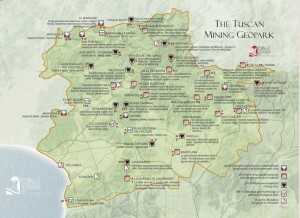 This territory embraces the area of the Colline Metallifere, one of most important ore districts of Italy. In this area, there are several sulphide orebodies that for their grade and size were intensely exploited from remote to modern age for production of lead, zinc, copper, silver, iron, pyrite, alum and lignite. There is very important evidence of recent and present geothermal and hydrothermal activities. These geosites are of high naturalistic relevance. 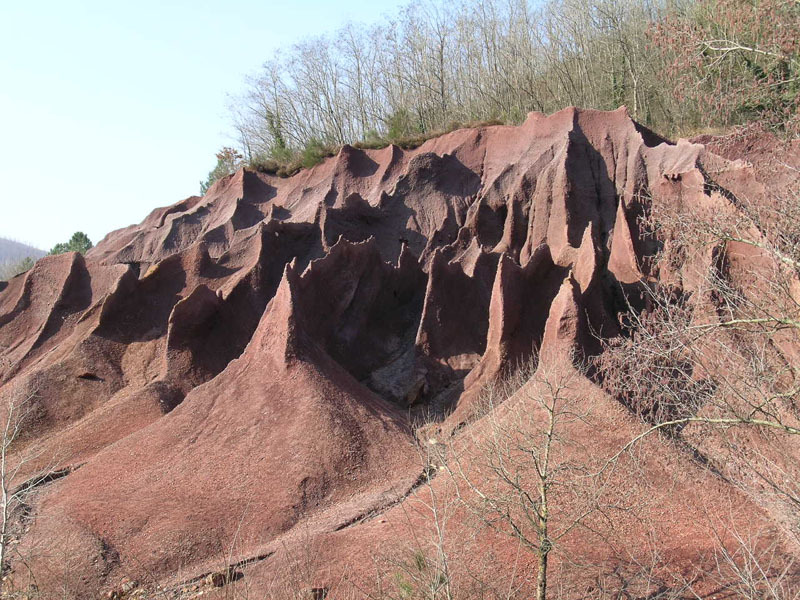 The territory in question is characterized by hilly slopes with frequent outcrops of limestone, and red clayey soils deriving from the action of external agents on the limestone. Of particular note is the presence of various phenomena such as: Karst formations, geothermal phenomena; thermal springs; and, finally, the large-scale mining and ore-processing areas. This heritage is characterized primarily by signs and evidences of geological, mining and metallurgical activities that occurred in this area of southern Tuscany for about three millennia. 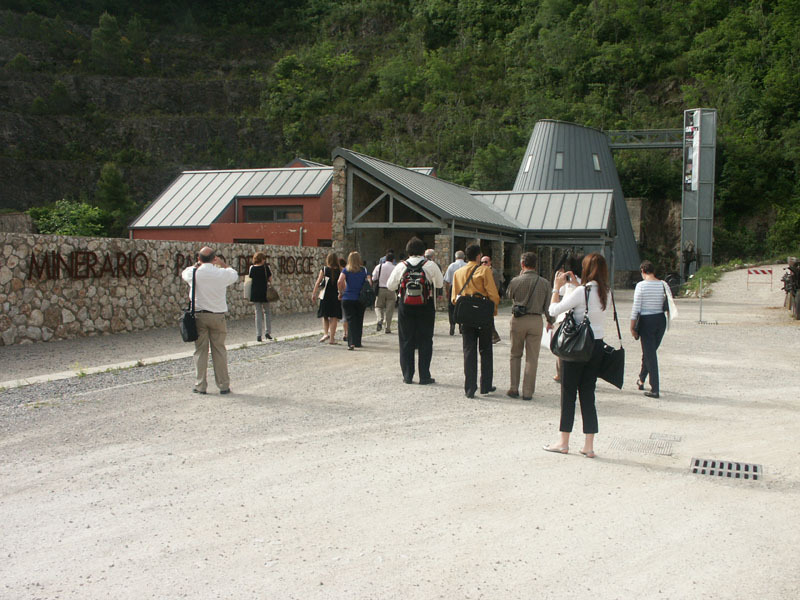 In view of this, the Parco delle Colline Metallifere is born as a Park focused on mining and metallurgical sites abandoned at the present time. In this frame, the Parco delle Colline Metallifere is equipped with an instrument, the Masterplan through which it has been taken a census of the technological and archaeological heritage of the Colline Metallifere, has been documented its historical, cultural and environmental value, have been identified strategies for the recovery, preservation, management and development of the archaeological, geological and industrial goods. The Park is a consortium managed by a Committee in which are represented all the Public Administrations involved: Ministry of Environment, Ministry of Heritage and Culture, Tuscan Region, Province of Grosseto, Comunità Montana delle Colline Metallifere and the seven municipalities. The management of sites and goods of Park and the initiatives for conservation, protection and valorisation of the territory are carried out by local government. The project envisages the opening of one or two reception points in the territory of each municipality defined as GATEWAYS TO THE PARK. The mission of the Gateways to the Park is to promote knowledge of the world of mining, of the geological heritage, of the historical landscape, of the history of mining activities and, above all, of the identity of the area of the Colline Metallifere. The gateways can be of various types (Information Centres, Documentation Centres, Libraries, Museums, Parks) and offer various services (information about the sites and the services and activities they offer, museum routes, guided tours, animation activities, workshops and educational activities, hosting displays and exhibitions, hosting events, sale of informative and educational material). The Park’s basic mission is to convert into development opportunities for the community, and for the local area, the remains of an impressive legacy of industrial archaeology which local councils and local communities have undertaken to conserve and develop, seeing in them a valuable foundation of their local identity, and an expression of a culture of work which for many long years has acted as a binding force for local society.